Scratch 3 introduces a new extensions system that provides collections of extra blocks to interact with physical devices and web services. Currently provides in the library are collaborations with micro:bit, JoyLabz, Google, Lego, and AWS. Extensions are all reviewed and approved by the Scratch team. Once added to a project, new code blocks will be added that can be used in the editor. The Scratch team is working on releasing guidelines and specifications for submitting user-created extensions. Once available, extensions will be able to be submitted to the Scratch team for review and approval before being added to the extensions library. In addition to these formal extensions, support for experimental extensions is in the works. This type of extension will be for individual use only and will not be able to be shared. They are planning for experimental extensions to replace the functionality provided by ScratchX. Some of the new blocks introduced with Scratch 3 cover features such as enhanced operators for manipulating strings, new pen blocks (including a transparent pen), and a glide block (that allows for more easily moving to a location). The sound editor was improved with a new recording system, improved audio trimming functionality, and new sound effects such as faster, slower, echo, and robot. There were changes to the paint editor as well, including a new layout, an eraser that works in vector mode, more control over vectors (including curve handles and a point mode), and additional layer control (such as bring to front). While much of the educational material have been updated to Scratch 3, work is still in progress to finish the remaining items. Harvard has already updated their Creative Computing Curriculum to take advantage of the new features. 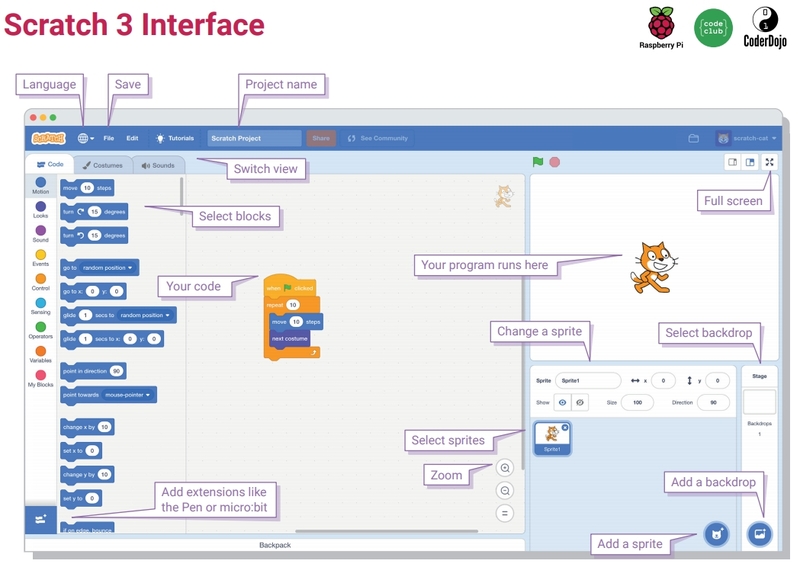 Raspberry Pi has updated most of their material including Scratch 3 versions of all projects in the Code Club Scratch Modules 1–3 and the CoderDojo Scratch Sushi Cards. Scratch remains free to use and version 3 is available in both a web version and an offline, desktop version. Offline versions of Scratch 1.4 and 2.0 are still available.